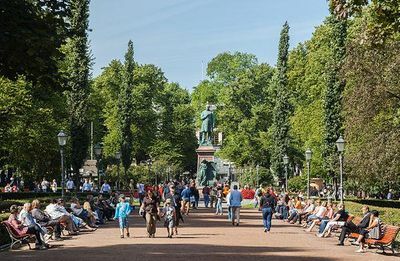 Esplanadi , colloquially known as Espa, is an esplanade and urban park in downtown Helsinki, Finland, situated between the Erottaja square and the Market Square. It is bordered on its northern and southern sides by the Pohjoisesplanadi and Eteläesplanadi streets, respectively. Aleksanterinkatu runs parallel to Esplanadi. Designed by the architect Carl Ludwig Engel, the park was originally opened in 1818. In 1827, Engels Teater, the first theatre building in Helsinki, also designed by Engel, was erected in a corner of the park.